“We have done what we can to reveal the truth, and we now urge you as members of the media, and we call upon elected officials, and other persons of influence to do what they can to share the revelation of this case to the widest possible audience.” – Coretta Scott King, married to Martin for 15 years, worked to communicate the facts of his assassination by the US government for 31 years: King Family Press Conference, Dec. 9, 1999. Expose 1% oligarchs in the US and elsewhere as OBVIOUS criminals centering in war, money, andmedia (also in ~100 other crucial areas). Initiate true freedom for all Earth’s inhabitants to explore ready breakthroughs in economics (links here) and technology, and discover what it is to be human without psychopathic criminals whojoke about killing millions, harming billions, and looting trillions. Dr. Martin Luther King’s family and personal friend/attorney, William F. Pepper, won a civil trial that found US government agencies guilty in the wrongful death of Martin Luther King. The 1999 trial, King Family versus Jowers and Other Unknown Co-Conspirators, is the only trial ever conducted on the assassination of Dr. King. The King Center fully documents the case, with full trial transcript. The King family’s attempts for a criminal trial were denied, as suspect James Ray’s recant of a guilty plea were denied. Mr. Ray said that his government-appointed attorney told him to sign a guilty plea to prevent the death penalty for his part in delivering the murder weapon for Dr. King’s assassination, and to prevent arrests of his father and brother as probable co-conspirators. Mr. Ray produced a letter from his attorney stating the promise that Mr. Ray would receive a trial. When Mr. Ray discovered that he was solely blamed for Dr. King’s assassination and would never receive a trial, the King family’s and Mr. Ray’s subsequent requests for a trial were denied. The US government also denied the King family’s requests for independent investigation of the assassination. Therefore, and importantly, the US government has never presented any evidence subject to challenge that substantiates their claim that Mr. Ray assassinated Dr. King. US corporate media did not cover the trial, interview the King family, and textbooks omit this information. Journalist and author, James Douglass: “I can hardly believe the fact that, apart from the courtroom participants, only Memphis TV reporter Wendell Stacy and I attended from beginning to end this historic three-and-one-half week trial. Because of journalistic neglect scarcely anyone else in this land of ours even knows what went on in it. After critical testimony was given in the trial’s second week before an almost empty gallery, Barbara Reis, U.S. correspondent for the Lisbon daily Publico who was there several days, turned to me and said, “Everything in the U.S. is the trial of the century. O.J. Simpson’s trial was the trial of the century. Clinton’s trial was the trial of the century. But this is the trial of the century, and who’s here?” ” For comparison, please consider the media coverage of O.J. Simpson’s trials: “Media coverage of the Simpson trial, which began in January 1995, was unlike any other. Over two thousand reporters covered the trial, and 80 miles of cable was required to allow nineteen television stations to cover the trial live to 91 percent of the American viewing audience. When the verdict was finally read on October 3, 1995, some 142 million people listened or watched. It seemed the nation stood still, divided along racial lines as to the defendant’s guilt or innocence. During and after the trial, over eighty books were published about the event by most everyone involved in the Simpson case.” Read more here…. 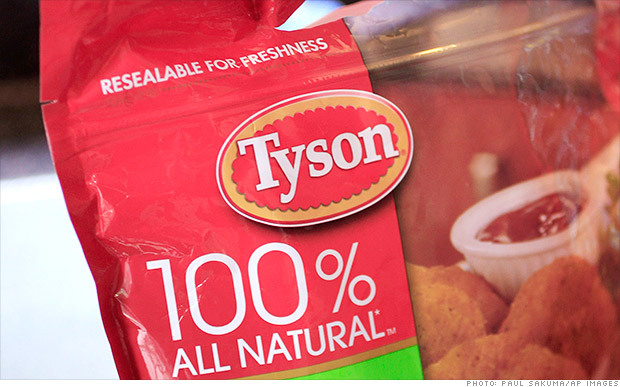 Tyson is recalling 75,320 pounds of chicken nuggets after some customers complained about finding small pieces of plastic in their food. The recall includes Tyson 5-pound bags of frozen, white meat chicken nuggets that were sold at Sam’s Club stores across the country. Complaints of plastic pieces in the nuggets were received by a “small number of customers,” the company said Friday. The problem was traced to a product scraper inside a blending machine, according the U.S. Department of Agriculture. The affected chicken nuggets were produced on two days, Jan. 26 and Feb.16, on a single line at one of the company’s 40 chicken production facilities. Related: Burger King tests Chicken and Waffle sandwich Tyson (TSN, Fortune 500) has received reports of minor oral injury due to the consumption of the nuggets. The recall also includes 20-pound bulk packs of nugget-shaped breast patties that were shipped for institutional use in Indiana and Arkansas. Those bulk packs have identifying case codes of “0264SDL0315 through 19” and “0474SDL0311 through 14.” The 5-pound chicken nuggets bags have manufacturer codes of “0264SDL0315 through 19” and “0474SDL0311 through 14.” The establishment number “P-13556” can also be found on the bags.